Younus and Mohamed, both business partners in Best Luxury Automobile, contacted me early last week in need of a website makeover. They had another individual create a website for their business about a month ago, but they were not happy with how the site looked and how it was presented. Younus noted that the website needed to be fully completed and done within two weeks – for which I let them know it shouldn’t be a problem depending upon how quickly I get their feedback for the work. With that, he paid the initial pre-payments over the phone to get us started immediately on the site. Within a few hours, BsnTech already had a design setup and ready for their information. We worked closely with Mohamed through many phone conversations to get the site perfected to his standard. Upon completing the English side of the site, they also noted that they needed to have everything translated into Arabic. Upon getting the translations, we put this other side to the site together. In just under two weeks, the site was completely ready and polished. The site just went live yesterday – about three days before their deadline. 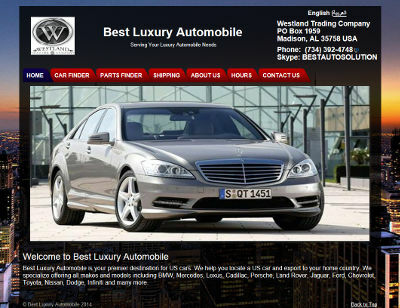 We appreciate the business from Best Luxury Automobile and look forward to creating them another website in the near future! The Best Luxury Automobile website is at bestluxuryautomobile.com.